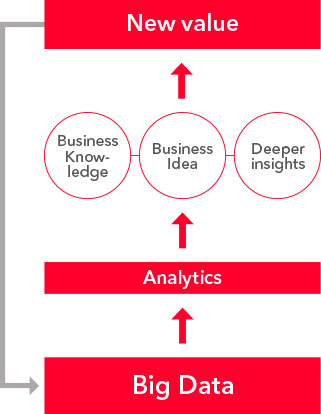 Analytics "THE FUTURE IS OPEN TO SUGGESTIONS"
We at Hitachi can help you move through the digital transformation of your business. Digital transformation is essential for companies to continually enhance their corporate value. This shift combines analysis and simulation, reflecting real world scenarios in a digital context. The process dramatically accelerates the actualization of business ideas and is the foundation of continuous improvement. Data analytics create new value by extracting insights from large amounts of data. Repeating these analytics in short cycles allows you to further accelerate the speed of your improvements and gain new abilities, ultimately leading to significant innovations. At Hitachi, we support digital transformation through long-term co-creation with our clients. It’s part of our commitment to you to solve your business problems and create new value. Our analytics are already accelerating the digital transformation of clients in many business fields. Engineering work and expertise can now be automated and passed on to others through digitization and data analytics. Engineering expertise plays a vital role in optimizing manufacturing work and formulating production plans. But because it is highly specialized, this knowledge has always been difficult to define and apply to wider, more efficient uses. Now, through the continuous analysis made possible by Hitachi analytics, your company is able to automate and digitize this expertise to use it in more areas of your business. For example, we helped a manufacturing company digitally reproduce 86% of the work involved in formulating production plans that was previously done by proficient engineers. As a result, they were able to raise quality and shorten development cycles in more areas of their business. It’s just one of the many challenges Hitachi has taken on as we continue to find new opportunities in automation. Facilities and equipment serve as the foundation of many industries. You can implement effective prevention and maintenance measures by discovering early signs of failure through an analysis of operational data. All businesses rely on the efficiency of their facilities and equipment. 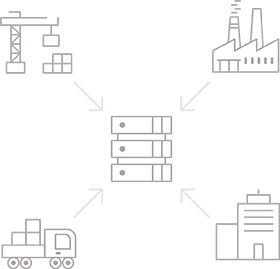 In order to operate at the highest efficiency, organizations must minimize the downtime caused by malfunctions and other factors. With analytics, we’re able to proactively predict failures by collecting and analyzing the data from these operational technologies. By implementing prevention and maintenance measures before mishaps occur, we can help make the best operational use of facilities, equipment and even whole businesses. Damages from increasing numbers of security breaches can be minimized by time series analysis of a wide variety of data. 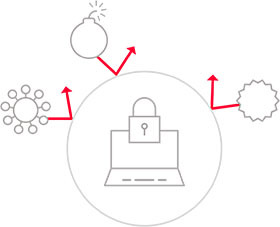 According to the report, Global State of Information Security , worldwide security incidents increased 38% in 2015 compared to the previous year. These breaches result in an astounding economic loss of hundreds of billion dollars per year. To help protect you from these catastrophic damages, our first step is to determine the causes of security threats. We do this with time series analysis through a comprehensive process that merges a variety of data from many different sources of information. Our Data Analytics Meister Service helps customers create innovation through a group of experts who possess both business knowledge and data analysis intelligence. Big data is big business. Hitachi helps you use big data to grow in the new digital economy by starting with a deeper understanding of advanced analysis products and information and communications technology (ICT) products. But we don’t stop there. 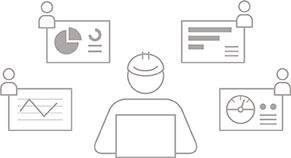 In addition to this innovative analytics approach, Hitachi also provides consulting through our Data Analytics Meister Service. Our Data Analytics Meister—a specialist in big data utilization—gives you a full walkthrough of the analytics process from start to finish. (1) Design a vision and set a goal. (2) Formulate a utilization scenario, in which a scenario for realizing the vision is developed—clarifying the value that will be created. (3) Verify the practical use in which the data analysis method is established and its efficacy is verified. (4) Implement the system, to apply the final execution. Our team works closely with you to help you through every stage of the analytics process. Pentaho is an analytics solution that integrates operational data and big data, enabling you to analyze your business from all angles. Pentaho analytics integrates a wide variety of data—from internal and external data to the vast amount of data collected through the internet of things (IoT)—and makes it available on demand for analysis. 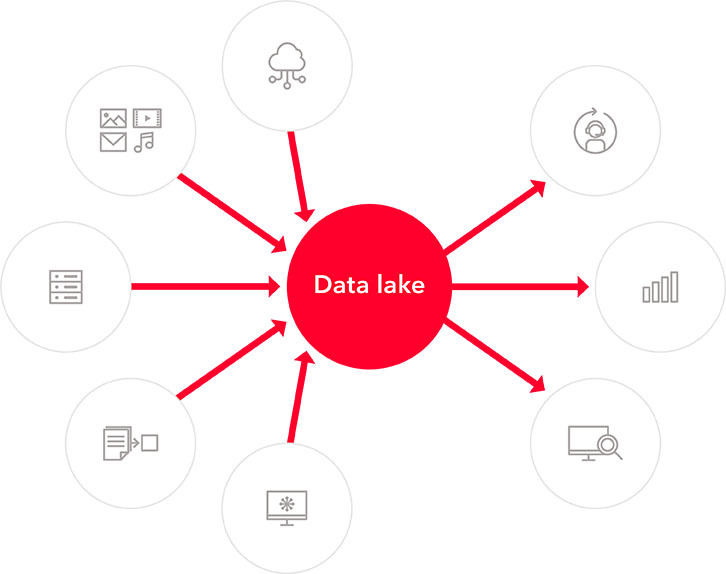 This solution aggregates all of the data into a “data lake,” and quickly provides a simple-format summary. It also offers a 360 degree analysis that helps users in different parts of your organization to quickly make the best possible decisions from accurate information. 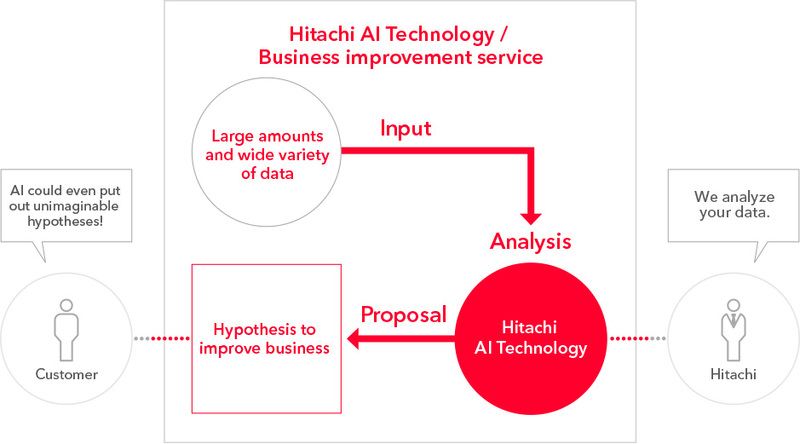 “Hitachi AI Technology” investigates large volumes of data to uncover effective hypotheses. Through years of research, Hitachi has developed an artificial intelligence technology that is creating real value for our customers. By conducting analysis beyond the limits of human capabilities, Hitachi AI Technology helps you uncover hypotheses and unimaginable solutions.